Printing stamps from home is a great way to save time and money when sending mail. It’s a cost-effective way to deal with all of your postage needs, regardless of how many letters or packages you send. In the following sections, we’ll look at what you’ll need to print stamps at home, and how easy it is to do. Printing postage stamps at home is meant as a convenient alternative to buying postage stamps from a US post office. This is why anyone can do it. You won’t need any special equipment. Everything you need to print stamps at home is listed below. Printer. Online postage stamps can be printed using any regular home printer. They do not require any sort of special equipment. Online Postage Stamps Provider Account. You will also need to subscribe to an online postage stamps provider. Make sure the postage service provider you choose is licensed by the USPS. If they don’t have authorization from USPS to provide online postage stamps, the stamps you print will be useless. For a complete list of reliable online stamp vendors see our article on where to buy stamps from. Note: There are plenty of discounts and coupons available for online stamp printing; you can see a complete list and how to get them in our guide to online stamps coupons. NetStamps Paper. To print postage stamps at home you’ll need a special kind of paper called NetStamps paper. This paper has certain security features that verify your stamps are legitimate. When you sign up for an account with an online postage stamps provider, you’ll most likely receive a few sheets of NetStamps paper. You can also order NetStamps paper from these providers. However, you can print shipping labels on regular paper as well. You can use clear tape to stick the postage stamps on the package you want to mail. A Weighing Scale (Optional). If you’re sending larger mail or packages, you’ll have to factor in the weight of your mail when calculating postage costs. Postage costs will determine how many postage stamps you need to print and attach to your mail. For this, you’ll need an accurate scale that can measure ounces. If you’re only interested in sending regular-sized letters, you won’t need a scale to print stamps at home. Note: If you need an overview of how the current shipping rates are calculated, we recommend reading our guide to postage stamp costs. Printing stamps at home is quite easy, once you’ve set up an account with an online postage provider. 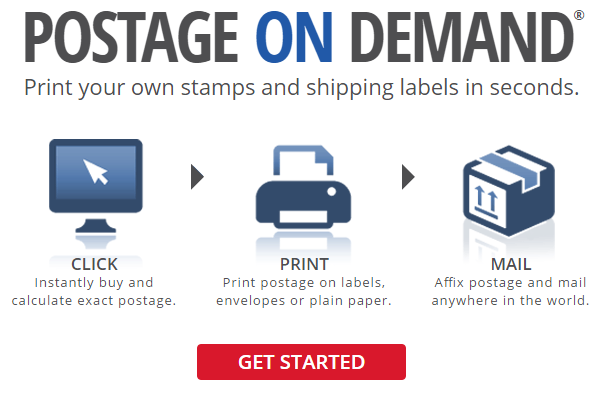 To start printing stamps from your home, you’ll need to log into your Stamps.com account or go to one of the other USPS authorized postage websites. You will be redirected to a new screen. In this screen, you’ll have to give details about the letter or package you are sending. These details include weight, size of the package, service type, your address and the address of the receiver. You’ll also have to input the code found on your NetStamps paper. This code will verify that your stamps are genuine. You can choose to apply special services to your delivery. Choose whether to print a full sheet of stamps or just a few, depending on your needs. Proceed to print the stamps on the NetStamps paper. Note: Be careful how you load the paper sheet in your printer. The postage stamps need to be printed in the special, designated spaces on the paper. You can reprint a sheet of NetStamps only once, at no additional cost.